Picit makes it possible to create formatted posts for Twitter, Facebook that include colored text in different sizes, tables, rules, bullets, pictures etc. 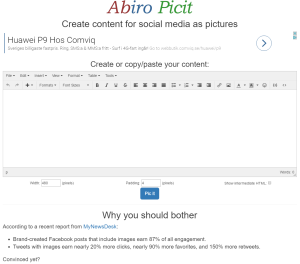 Picit was developed by Abiro. Development started December 30 2016 and phase 1 ended January 3 2017.